Libby’s Post – What has Evan done? So I met Evan at the Waffle House today, at 1:00 p.m., just like he asked. I did my best not to cringe as I walked inside. And as I expected, I was BY FAR the best-dressed person there. I’m not sure why people think it’s acceptable to go out in their pajamas and oversized Tweety bird shirts, but they do. It didn’t used to be like this, at least not that I can remember. 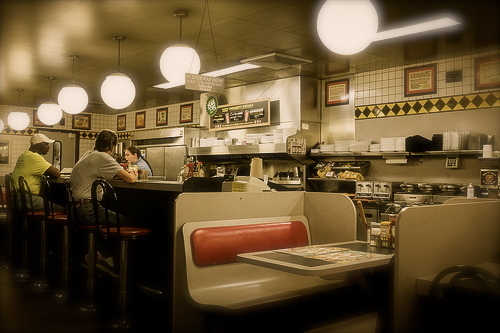 Evan and I practically lived at the Waffle House when we were younger. It was around the corner, had good eats and was open 24 hours a day–perfect for our secret late night rendezvous. We would sit, side by side in a corner booth, and plot and plan and scheme. We were going to make it be big. We had to. We had to be better than our middle class parents. We weren’t going to struggle to pay the bills or put our kids through college. And we were going to have a huge house and fancy cars and designer clothing. We’d finally be able to stop pretending to be the people our friends thought we were. I could stop searching for Guess jeans at the Goodwill and buy them new and with a credit card of my own. Soon, we would be envied. People would be jealous of us, and all the things that we had. It was just a matter of time. Today, we sat across from each other in our old corner booth. It had been more than ten years since I’d eaten there, but really, are you surprised? Once I had more than a few dollars to my name, I was schmoozing the society ladies at Antoine’s. 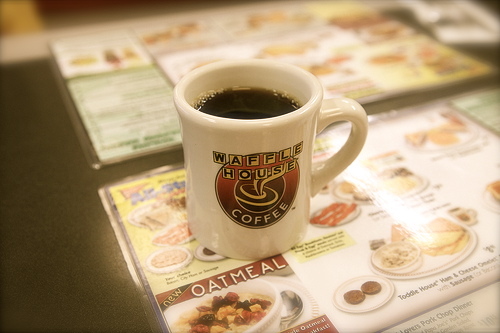 I couldn’t be seen at a Waffle House, even if they did make amazing waffles and hash browns. “Where’d you stay last night?” I asked, wiping a suspicious looking smear near my water glass. 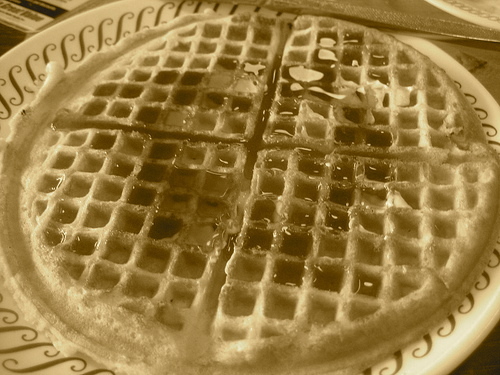 My mouth full of waffle, I nodded for him to continue. Image courtesy Sam Howzit via Flickr. My heart began to race. I took a deep breath and pushed my plate away. “Well that’s just great. Way to make things way worse, Evan.” I grabbed my purse and started sliding out of the booth. He nodded and began to talk, but I turned and stormed out. Dealing with this lady should be easy. At least with Nerdo Vamp’s help. The thought of not having money–that was making me sick. Thanks. It’s been really fun to develop and just see where it takes me. Thanks for reading! Funny–it isn’t being a vampire and being followed, but the thought of having no money that made her sick. I love her priorities, and you have put me in the mood for waffles! Great stuff! (I share Libby’s distaste of that smear near the glass). No job – now things are getting serious…! I know. Really serious. Vampires – no biggie. Slashing her shopping budget – a monumental disaster. Libby’s certainly a character – in all senses of the word! A broke vamp? Oh no! I love the “humanity” of your characters. Also…I really feel like a big plate of waffles. I can’t wait to see how she is going to get them out of this mess! I’m sure she’ll figure out something. Libby has never ceased to amaze me! Glad to see his secret wasn’t a bad guy secret…this time at least 😉 I love this story and cannot wait to see what happens next.